This book came about as a result of the authors’ own practical experience in Help Desk operation and management and of hundreds of workshops the authors have conducted world-wide over a period of fifteen years. It is intended to be a practical reference guide, but the suggestions, checklists and templates all need to be interpreted and amended in the light of the culture, technology, service maturity and constraints of each individual organization. Good help desk customer service has no history. Bad call center customer service has infinite history. Delegates frequently ask: “What is the best Help Desk software package?” or “What is the best way to set up a Help Desk?” Our only response has to be “Best for whom? It all depends.” A key objective of this book is to show how and why “It all depends” and to provide readers with the best possible information on which to understand and evaluate options and to select the best – for them. If there is one thing we have learned over the last years, it is this: Good service has no history. Bad service has infinite history. Based on extensive feedback from delegates from most of the Fortune 1,000 companies who have attended courses presented through Frost & Sullivan (Europe), AIC (South Africa), Monadnock (UK), The Infomatics Resource Centre (UK), IIR (UK), Digital Equipment (UK), Logtel (South America), CEL (Asia Pacific), UPMOCL (Middle East), Finborough Seminars, as well as delegates of in-company training for organizations like Dow Europe (Switzerland), The Intervention Board, BP, Shell International Petroleum, Logica (UK), Arthur Andersen (UK), Rolls Royce (UK), Global One (Germany and USA), Caterpillar (Switzerland), GAK (Netherlands), European Commission (Belgium), Transnet (South Africa), Sun Valley (UK), Nikon Precision (UK). A Rothstein Publishing Classic title. Do you want a Help Desk as a strategic tool – the stethoscope on the heart of the organization, identifying the slightest sign of sickness, prescribing treatment to keep the patient – the whole organization – healthy? 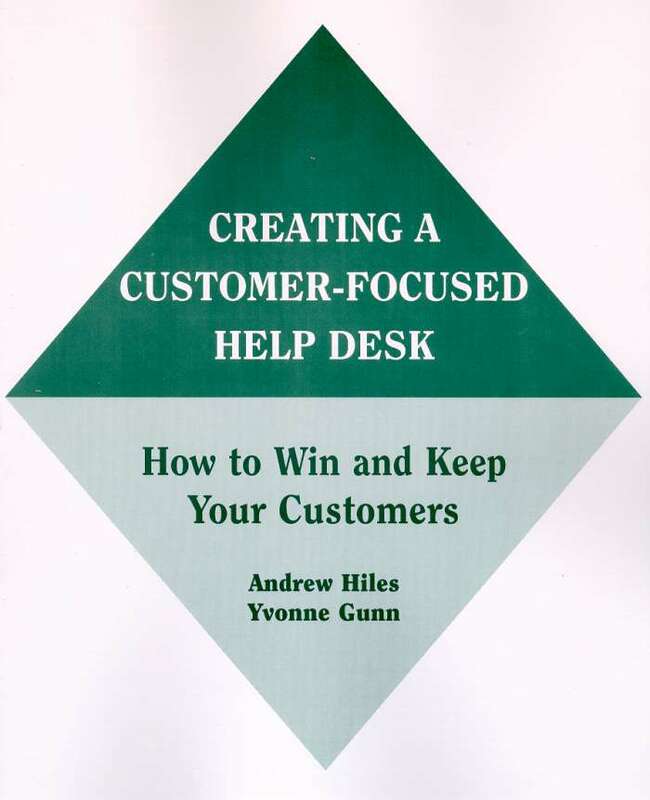 Is the Help Desk a key part of competitive edge marketing? Why do users need a Help Desk? Users have to deliver their contribution to the corporate plan; they have to meet their own deadlines; they have to live within their budgets; they have their own staffing constraints and may have as their objective a requirement to add value to the services they receive from IT. In addition they have to live within audit and security constraints. The users therefore are dependent upon effective and rapid response from IT to permit them to meet these objectives. Many IT and Computing Service Managers assume they have a good relationship with their users when in fact there may be some serious problems. Perhaps they do not have regular contact with the users or perhaps the users have just given up trying to get a decent service. Some IT Managers still do not give a high priority to users’ satisfaction while others expect a certain level of dissatisfaction and as long as this ‘noise level’ is not too high they ignore it. Users may have built up their own informal contact network to get some satisfaction. This may be user-oriented individuals within IT; it might be other users from whom they can get advice; or worse still it might be suppliers. In the worst case the suppliers may be actively working against IT in order to sell users hardware directly and so ‘solve’ users’ dissatisfaction by putting resource directly into their hands. Even if surveys are carried out the people to whom the survey is directed may be the managers of those who use the service and the message passed back to IT may be highly sanitized or political. The image of the Help Desk that we would like to aspire to is of a proactive, cutting edge, business oriented, customer focused support function that adds value to services, enhances customer satisfaction, retains existing customers and attracts new customers. But how true to life is the image? Is the Help Desk really an admission of failure? Is an Information Technology Help Desk necessary because poor project management, lack of quality assurance and quality control and inadequate testing have resulted in release of software which is bug-ridden, or not fit for its purpose? Is a widget product Help Desk necessary because the inappropriate quality of raw materials and poor supervision result in excessive re-work? Is it because bad design, poor packaging and careless handling causes damaged product to reach the customer? In short, is it simply reacting to problems? The proactive Help Desk can be a strategic tool for building good reputation, for marketing, sales and competitive edge. The Help Desk that identifies problems can spur business process improvement – better, more reliable processes. It is seen as an asset to any business. It has its stethoscope on the heart of the organization, pre-empting problems, creating value and goodwill. It is likely to be held in high regard by senior management, who appreciate its contribution to business results. Because of this, investment can be justified: in advanced Help Desk tools; in resource; and in training. Staff morale is likely to be high. The reactive Help Desk, however, gets associated with the poor service or product that it is there to protect. It is seen as an overhead, typically starved of investment, resource and training. Typically, in the reactive Help Desk, staff are over-worked, under-appreciated and not supported by appropriate equipment and tools. Staff morale tends to be low and turnover high. The solution to the reactive Help Desk is simply to get things right so that the Help Desk becomes less necessary. A high problem level is trying to tell the organization something. That something is usually that management action needs to be taken to fix the problems at source – permanently. Since 1989, we’ve been publishing an extensive, informational suite of books, templates, software and videos in these areas and have recently added topics such as Cybersecurity, Enterprise Security Risk Management, and a new approach to Business Continuity, called Adaptive Business Continuity.